3/4" MDF all components unless identified below. 1.75" x 1.75" x25.1875 - cross brace / base for monitor glass. See drawings for more details about cuts. NOTE: Please read the FAQ about material selection. What does Cabinet Accuracy mean? 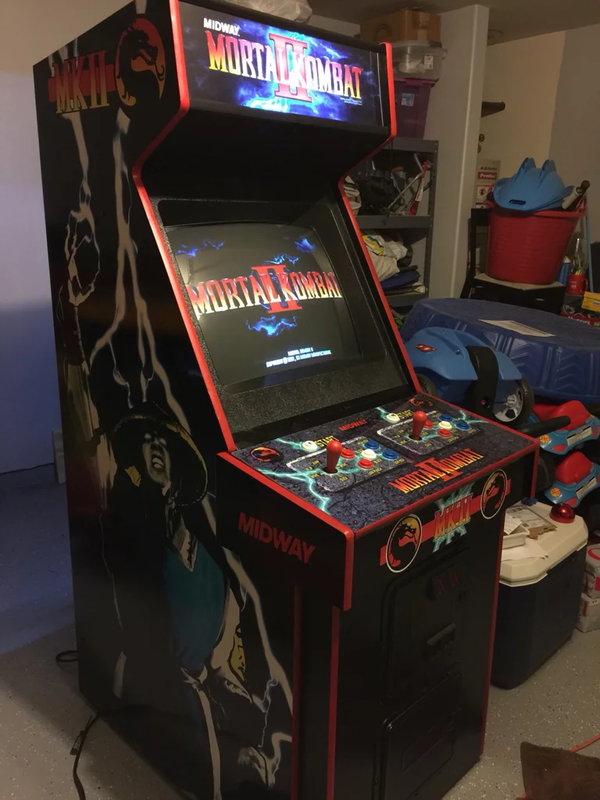 NOTE: Mortal Kombat 4 shares the same cabinet as Killer Instinct 2. Dedicated midway cab. Accurate to within one inch. Full bezel arts and instructions. By Gozer. 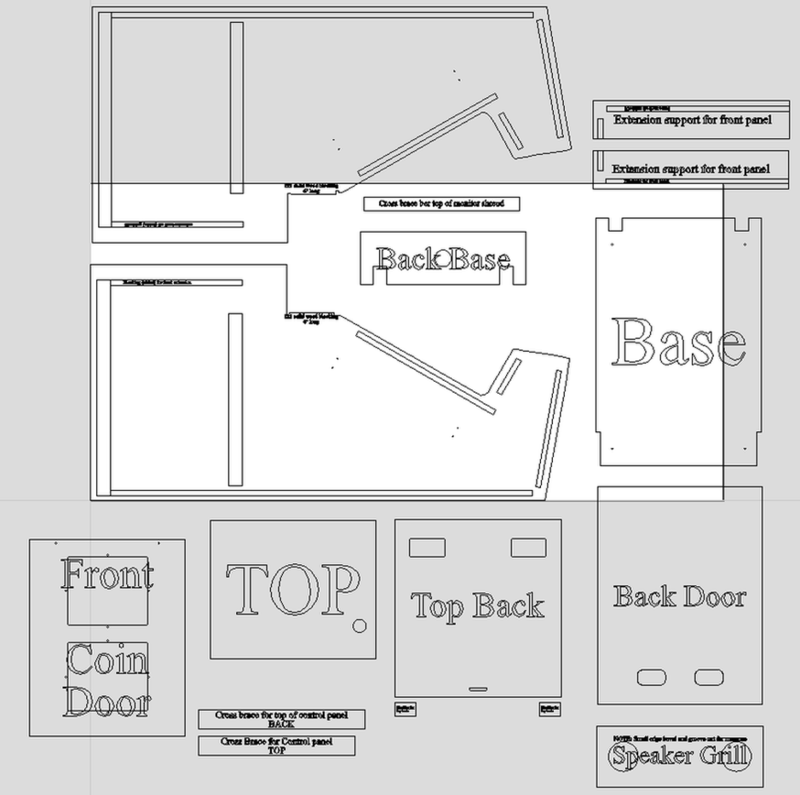 NOTE: The Sketch Up drawing has the wrong coin door. Note: .CRV files do not contain tool paths. The below files are PDF documents of the plans that are printed to scale. These documents can be taken to your local print shop and printed on 48" wide media. 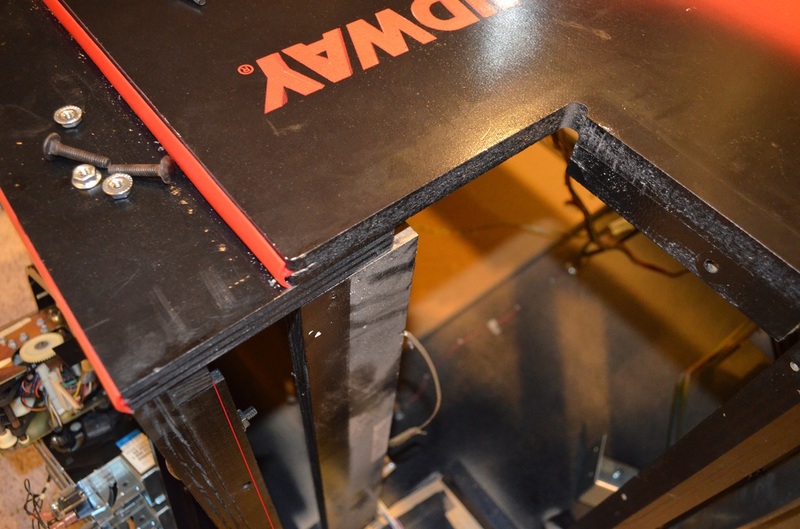 The prints can then be applied to the wood and used as a template to cut the side panels of the cabinet. I have only included the side panels and any other panels that may be more difficult to cut. Mortal Kombat 4 may share the same button placement and layout as Mortal Kombat 3. This has not yet been confirmed. 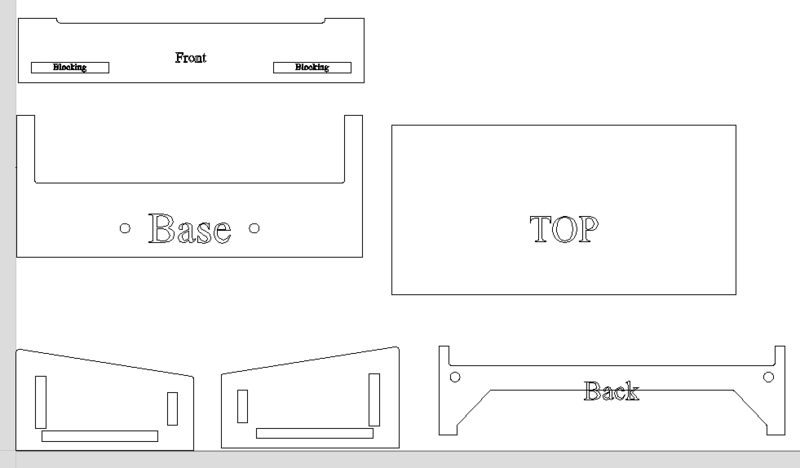 Drilling template for the Mortal Kombat 3 control panel is available on the Mortal Kombat 3 webpage. The purpose of the reference photos are to assist with assembly. They allow for a visual reference on how joints are assembled and edges overlap. As identified in the construction type section above, the Midway cabinet has some wood components that are not standard plywood as part of the construction. These are illustrated below. In the picture below, there are 3 solid pine "skids" placed on the bottom of the cabinet to help protect the base. See the 3 red lines below. 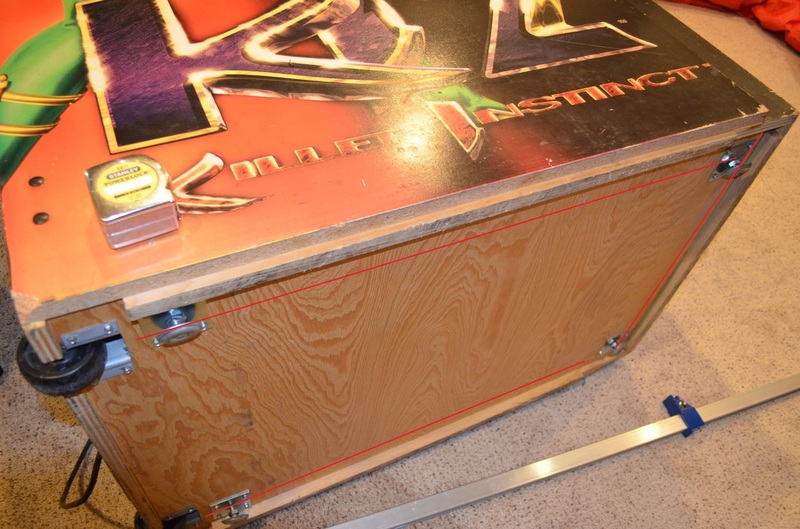 The 2 pieces that run parallel with the side panel of the cabinet are 30" long and the single front "skid" is 22" long. All of these pieces have measured edges of 1" in length. The blocking listed below is also listed on the cabinet CNC/CAD drawings. This is also solid pine with measured edge dimensions of 1" and a length of 6 inches. These pieces are how the control panel bolts to the cabinet. Not the best picture.... but there is a 1" square solid pine support on the back of the front door as well. This piece is how the control panel bolts to the cabinet. 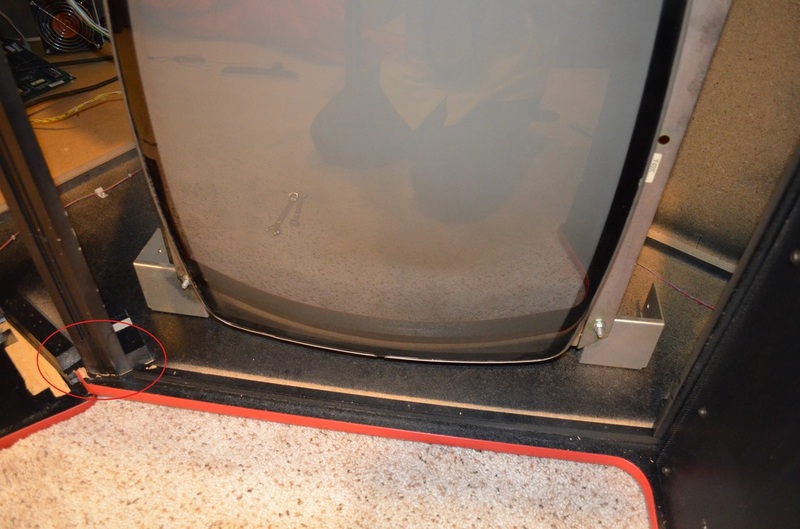 The last addition is the cross brace for the cabinet / monitor shroud / monitor glass. See the profile picture in the CAD drawings for reference. This piece measures 1.5" on edge prior to being cut. "The plans were very accurate. My brother lost an MKII in the Harvey flooding and I rescued as many parts as I could, including his control panel which I used to replace mine. Side by side they are identical! 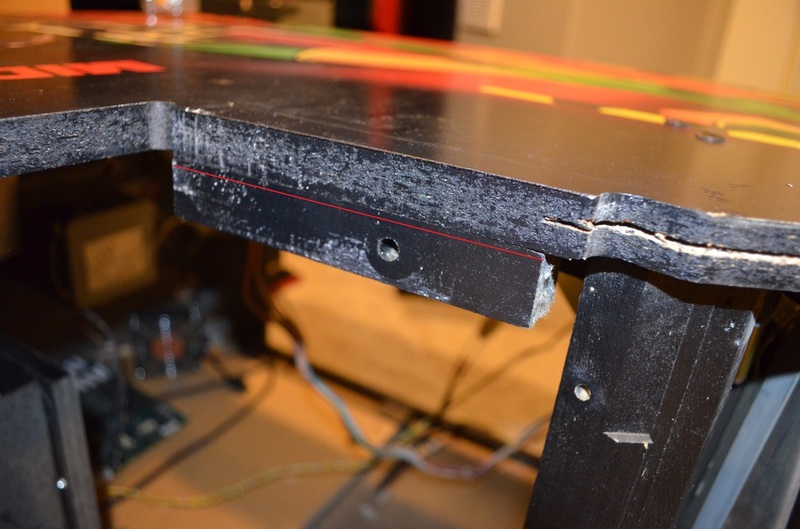 The only snag i ran into was the little dip on the sides of the cabinet where the control panel rests. I had to trim them down some because the control panel wasn’t going down all the way. And the most difficult part was figuring out the angle on the sides where the monitor goes. Other than those things, everything went fairly smoothly.